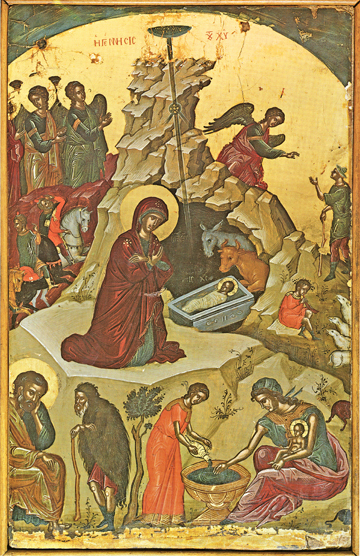 One of the famous 16th century Stavronikita Festal set of icons, this icon depicts the birth of Jesus Christ on earth in the cave at Bethlehem (Hebrew for House of Bread), as He is the true Bread Who came down from Heaven for the life of all men. The Virgin Mary kneels in adoration, the Star of Bethlehem shines down from above on the Divine Child, the Magi are coming on horseback, the Angels stand in wonder and tell the shepherds to come to see this most marvelous event in all history, as the midwife washes Jesus, and St. Joseph wonders, talking with his thoughts outside the cave. The monk Theophanes the Cretan painted this set of icons on the iconostasis, or icon screen which separates the Bema, or sacred Altar, from the body of the Church, or Nave, where the Faithful stand for Divine Liturgy and other liturgical services. The set shows many of the most important events in the life of Jesus and the Church in its early and formative stage. This icon is the second in that set. Theophanes’ icons are considered masterpieces of iconographic art, still adorn the church at Stavronikita Monastery on Mount Athos, and show marvelous Cretan post-Byzantine form.